One of the great things about volunteering at L’Academie (besides the great recipes and hands-on learning) is meeting the chefs. It’s great to be exposed to the different kinds of styles, to hear their story on how they became who they are today and to just pick their brains. Every chef reached their dream in a different way and a few of them realized their dream wasn’t what they first thought it was. Christine Ilich is a formally trained chef that I’ve mentioned briefly before after volunteering for one of her classes. She runs her own business, Heirloom Kitchen, in Front Royal making homemade soups, breads and sweets. I can tell you that her bread baking classes are immensely popular, but it was her soups that hooked me. We made three; a bisque, minestrone and a chowder. All very different, all amazing and all flexible with the recipe (cooking is an art!). I was a fan. 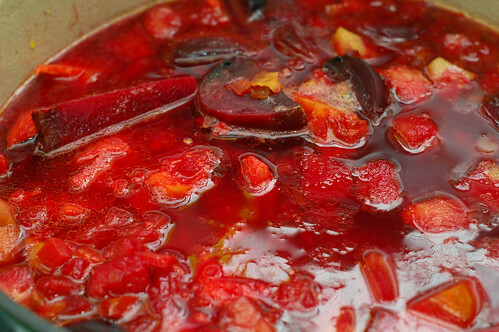 During the class we somehow got on the discussion of other soup and she mentioned today’s recipe: Apple Autumn Borscht. 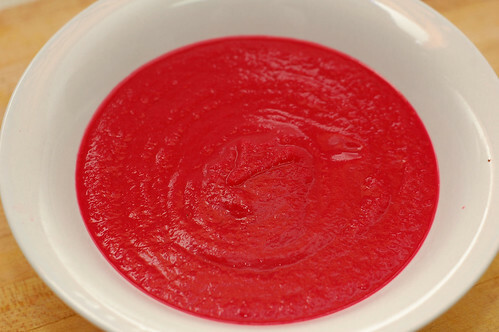 I had never worked with beets before, never mind made a borscht, so this was a great experience to broaden my horizons. While the ingredient list for this dish isn’t particularly long, its flavor is deceivingly complex. I dare say most would not be able to identify the ingredients from taste. I strongly recommend you try this recipe and if you have any questions for Christine, send her an e-mail. Chop the vegetables into large pieces since everything will be pureed in the end. Place butter, carrots, apples, onion and ginger in heavy bottomed soup pot. Sauté until vegetables are softened, but not browned (a little color is ok). Add beets and cover with water. Bring to a boil, season with salt and pepper and reduce to simmer. 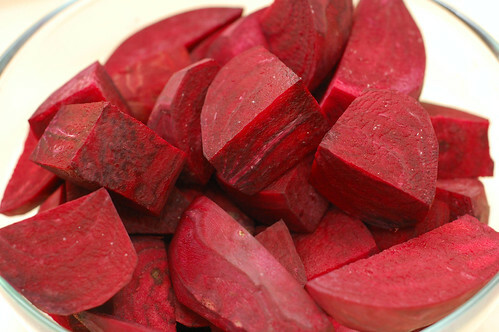 Cook for about 10 minutes, or until beets are starting to soften. Add sweet potatoes (and more water if needed, to just cover the potatoes) and cook until all veggies are very soft. Add spices and lemon juice. Puree the mixture in blender with the cream. Taste and re-season if necessary, with spices, lemon juice, salt and pepper. Serve hot with a dollop of sour cream.